The new Kino Lorber Blu-ray release of It’s The Old Army Game (1926) starring W.C. Fields and Louise Brooks is wonderful; an entertaining comedy, a beautiful print, lovingly staged close-ups of Louise, and dozens of time travel moments filmed on location in Ocala, Florida, to be covered in a later post. 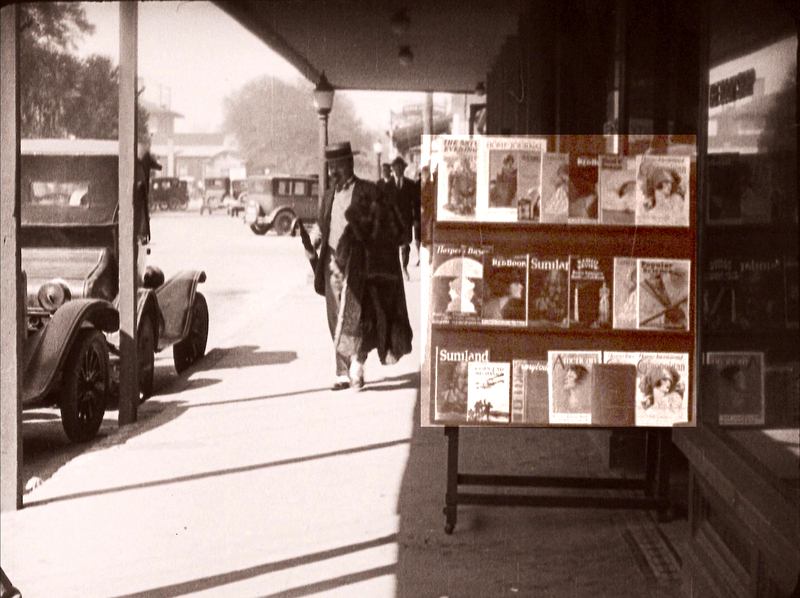 One captivating detail appears twice during the film – a book store’s sidewalk magazine display, loaded with March and April 1926 issues of popular magazines. Above, Louise pretends to glance through a Redbook while keeping an eye on her love interest played by William Gaxton. Later Fields runs past the same stand, momentarily providing a direct view of its contents. 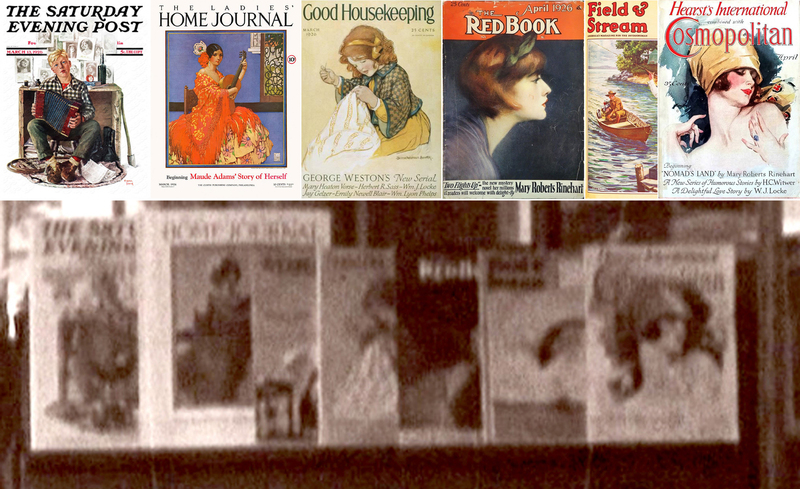 Zooming in, the top row of the magazine stand (above) displays the March 13, 1926 issue of The Saturday Evening Post, the March issues of The Ladies Home Journal and Good Housekeeping, and April issues of Redbook and Cosmopolitan. Also, represented by a June 1926 issue, is either the March or April 1926 issue of Field & Stream. The next row features the March 1926 issues of Harper’s Bazar and Radio Review, and the April 1926 issue of Popular Science. 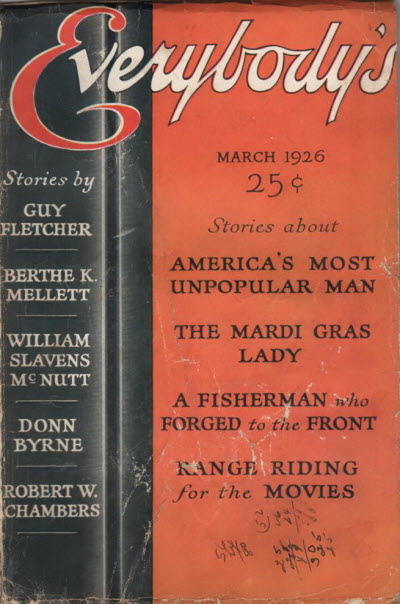 The March or April issue of the Florida travel magazine Suniland is represented by the October 1926 issue. That’s another Good Housekeeping peeking left of the Popular Science. 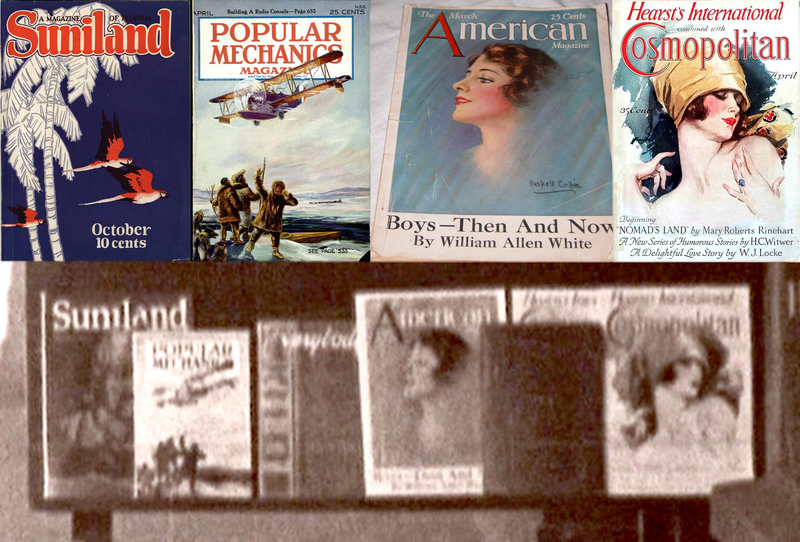 The bottom row of the stand displays the April 1926 issue of Popular Mechanics and March 1926 issue of American. Update: reader Jill Hobgood reports that the bottom magazine third from the left is the March 1926 issue of Everybody’s Magazine. Thanks so much Jill for tracking this down. There are so many scenes filmed in Ocala that I will cover them in a later post, but if you can’t wait to see some other early Florida locations, check out my prior post showing how the disastrous family picnic sequence was filmed in Palm Beach at El Mirasol, the estate of Edward T. Stotesbury. It’s The Old Army Game shows us, once again, the rich visual history hidden in the background of silent films. Stay tuned for a detailed account of Fields and Brooks filming on location in Ocala, Florida. Read all about Louise at Thomas Gladysz’ Louise Brooks Society Blogspot. This entry was posted in It's The Old Army Game, Louise Brooks, Ocala Florida, W.C. Fields and tagged 1926 magazines, It's The Old Army Game, Louise Brooks, Ocala Florida, W.C. Fields. Bookmark the permalink. It’s Harper’s Bazar… not Bizarre. Thanks for another great post. Oops – thanks for that! Although Bizarre has more of a ring to it. Is it Redbook or Red Book, or The Red Book? 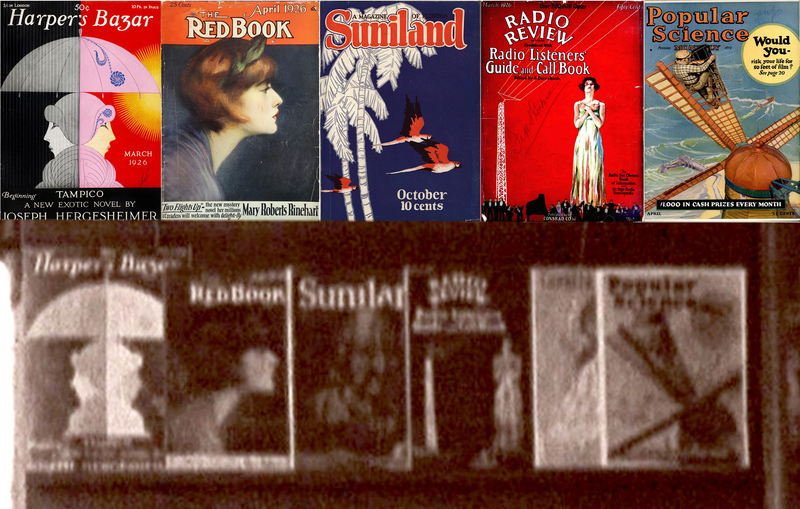 It’s been both… it started out as The Red Book, and changed to Redbook in 1929. Excellent work again, as always! Well spotted on the mag stand. Louise is simply gorgeous – just love the Ziegfield Girl walk! The magazine between Popular Mechanics and American is almost certainly Everybody’s Magazine.